Official artwork of ReDead from The Legend of Zelda: Ocarina of Time. 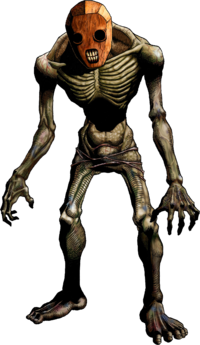 ReDeads (リーデッド, ReDead) are enemies from the Legend of Zelda series. A ReDead attacking Link in Ocarina of Time. 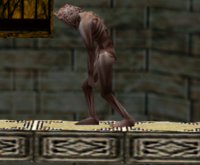 ReDeads are zombie-like enemies which debuted in Ocarina of Time, later appearing in Majora's Mask and Wind Waker. Their design in the Smash series comes from the first two games. They normally remain stationary or move around sluggishly, but when they see Link, they release a high-pitched scream which freezes Link, allowing the ReDeads to latch onto and strangle him. In Ocarina of Time, ReDeads appear in Hyrule Castle Town, strongly implying that they were actually former civilians of the area prior to Link's seven year absence (though they can also be found before the time skip, by exploring some of the graves in the Kakariko Village graveyard). In their trophies in Melee and Smash 4, though, it states that they are just magically animated clay. A ReDead in Melee's Adventure Mode. ReDeads made their Smash debut in Melee, and they were first announced at E3 2001. They appear as enemies in the Underground Maze of Adventure Mode; they are usually found in the main area with the broken, floating platforms. Usually, there are about one or two ReDeads per platform. In other areas, especially in the tunnels connecting the map, they can be found in groups of three or four. ReDeads will sometimes leave a trophy behind when they are KO'ed. They can also occasionally appear out of container items in regular battles. They are one of the four common enemies that can appear on any stage. For every ReDead the player KOs, they will get 800 points added to their total score, as part of the ReDead KO special bonus. These ReDeads have a slightly darker skin color, but their behavior is the same as their Adventure Mode version. ReDeads attack fighters by limping towards them. Once the ReDead identifies its victim, it will charge at it, latch on, and bite it. The amount of damage the ReDead deals depends on the difficulty. The higher the difficulty, the more damage it deals. Mashing the controller buttons shakes the creature off, stopping its damaging process. After a few attacks, the ReDead will fall down on the ground, and will remain so for a few seconds. 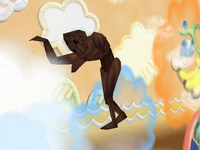 However, if left in this state, it will eventually revive and continue to walk around and attack the player; therefore, the player must inflict more damage to remove it from gameplay. Seven years after Ganondorf took control of Hyrule, ReDeads roamed the ruins of castle town, moaning. Link was shocked at the state of the town, and the apparent lack of survivors. He later learned that the townsfolks had evacuated to safety, and the ReDeads were magic animated into hideous humanoid shapes. The ReDead's only appearance in Brawl is as a sticker. A ReDead, having stunned Marth with its scream. ReDeads appear as enemies in Smash 4's Smash Run. They initially stand still, but when a character gets close enough, they release a powerful scream which stuns grounded players and pushes airborne ones. After this, they then get closer and attack with a powerful swipe; the stun of their scream can also potentially make players open to attack from the Smash Run's numerous other enemies. Graphically, ReDeads now resemble their updated look from The Legend of Zelda: Ocarina of Time 3D. The ReDead trophy appears in both versions. In Super Smash Bros. for Wii U it is part of the Ocarina of Time & Majora's Mask Trophy Box. These creatures may look like zombies, but ReDeads weren't human to begin with. They appear to be clay monsters fashioned in the shape of humans. They attack Link when he gets too close, the spine-chilling sound they emit difficult to describe. Don't bother—just get rid of them! These creatures may look like zombies, but unlike the walking dead, ReDeads have never been human. They just seem to be clay monsters fashioned in the shape of humans. They attack Link when he gets too close, making spine-chilling noises that are hard to describe with words alone. Best not to try - just get rid of them! ReDead appears as a Spirit for the game's Spirit mode. ReDead are one of the few enemies in Smash Run to have a voice, heard through their wails. This page was last edited on March 9, 2019, at 19:58.